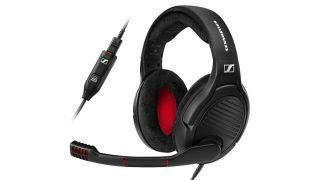 Sennheiser has revealed the PC 373D headset, which it claims will give gamers the ultimate audio experience on several fronts, from clarity of sound through to comfort levels. This headset gives you 7.1 Dolby Surround with the company's "unique transducer technology" ensuring clarity and accuracy of sound placement, the latter being particularly critical when it comes to competitive gaming, of course. You also get a Surround Dongle which allows you to customize the audio on-the-fly, and you can click one button to quickly switch between stereo and surround sound as needed. For further audio tuning, the enterprising gamer can head to the Sennheiser software where a graphic equalizer boasts optimized modes for immersive and competitive gaming, as well as an eSports mode (that's extra-competitive, we guess). There is also a music setting for when the gaming session is finished and you want to kick back and relax listening to some chilled tunes. The built-in microphone boasts noise cancellation and also optional noise reduction, ensuring that when you shout at – sorry, we mean speak to – the rest of your team, you're heard with clarity. No matter how good a headset claims to be, it has to be comfortable to be worn over long gaming stints, and this peripheral offers large ear cups cushioned with "plush velvet" no less – so it won't only be the audio which is giving your ears a treat. The headband is padded, too. The PC 373D headset should be out before the month is over, and carries an asking price of £210 (around $275, AU$370).